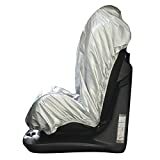 Reflect and block sunlight to keep your kid’s car seat nice and cool with the Child Car Seat Sunshade Cover from OxGord, a premier manufacturer and supplier of automotive parts and accessories. Reflective: The newly redesigned 2019 version of our sunshade for car seats is the ideal way to protect your kid’s car safety seat. It reflects harmful UV rays which will heat both the car seat and metal seat belts. By reflecting the solar rays not only will you lower the temperature of the car seat, but you will also prevent fading, cracking, and other damage which can be caused by frequent exposure to the sun. Breathable: Our sun shield cover also allows for ample airflow, which will help cool down the booster seat. This provides a more comfortable and cooler travel experience. Great for a front passenger side car seat as well as the back driver and passenger rear side seats. Unlike other brands of car shades, It does not matter what the year, make, and model of your vehicle is. Our cover is very large and the elastic allows it to fit various sizes of children seats. This means it will fit most carseat models on the market. Please contact us if you have questions regarding your specific car seat model. We also offer a variety of protectors for the interior, exterior, and windshield of your automobile. Please don’t hesitate to contact us with any questions, comments, or concerns. Please see other OxGord products to fulfill all of your auto supply and accessory needs. Your child’s car seat needs the best and most effective sunshade. Simply open it and pull it over the seat and it covers it entirely. Keeps the seat cool and protects the seat from wears and tears. Most importantly, it keeps your little one comfortable while you are on those long road trips. Don’t let heat slow you down. Don’t wait for the seat to cool down while you run the AC that might increase your fuel cost. Get the OxGord Child Car Seat Sunshade today!!!!! Please NOTE: Even outside temperatures in the 60s can cause a car temperature to rise well above 110° F. When the outside temperature is 83° F, even with the window rolled down 2 inches, the temperature inside the car can reach 109° F in only 15 minutes.